Jeffrey Kaufman has a broad range of experience in real estate development, finance and banking. He represents major institutional lenders and private developers in construction lending, industrial development bond financing, hospital financing, leveraged buyouts, sale-leaseback transactions, convertible mortgage transactions, and real estate financings and workouts. 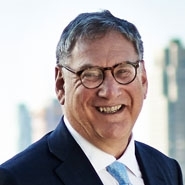 Prior to joining Herrick, Jeffrey was an associate at Schulte Roth & Zabel LLP and before that, assistant general counsel of the Federal Home Loan Bank Board.